Dowsing for dollars, blockading for cruelty, leaning on purpose, a filthy infection, metering quackery and more! ADE 651 - Dowsing for a stash of cash. Israeli blockade incident - Well, it is technically piracy, but is it unusual for powerful nations to do this? New leaning tower - Does it count if it leans by design? Editor’s Choice: Filthy is okay - But his computer isn’t. The Quackometer — Imagine there was a way to determine, simply by copying a URL into a box, if a suspected site is a quack site? That’s what The Quackometer is all about. Using key words and such, the Quackometer is an experiment to see if a determination can automatically and reliably be made as to whether or not a site is a quack website. The quackometer is a project based around the automation of debunking quack medicine on the web. The web is full of pages supporting dubious medical claims and inflated capabilities for cures. The freedom that the web gives us to express our views, entertain and do business also gives quacks a way to make a living by promoting nonsense treatments to unsuspecting people. Spotting these web sites appears to be easy when you know what to look out for. If it is that easy, can the process be automated? The quackometer project intends to find out. Just for fun, I ran Herbal Remedies for Diabetes from a site called How Stuff Works through the meter. (Finding a site pushing quackery with a neutral name is not all that easy to do, by the way. Words like natural and alternative are used as selling points and are in most of the quack product descriptions.) The result? This web site has more quackery than my village pond. It is full of scientific jargon that is out of place and probably doesn’t know the meaning of any of the terms. It shows little or no critical thought and so should be treated with caution! It also looks like this site is trying to sell stuff. Buyer Beware! The site earned ten canards with a graphic of ten ducks in a row. Ten being the worst. Wednesday: The night began with mention of how Filthy has been AWOL from us for the past three weeks or so. After a little reminiscing about the old AOL chat rooms, chat soon turned morbid with a mix of necrophilia and morticians. Dave reveals that he was once in the movie which included a female necrophiliac coroner, but for the rest of the night he couldn’t recall (or find) the name of it. This left many of us trying to guess what the name would be, so Kil blurts out, “Deadwood.” The mention of Dave’s short-lived stardom started a chain reaction with everyone recalling stories of meeting famous celebrities. Eventually chat moved on to forum talk, most notably these threads, focusing on our (lack of) moderation rules. 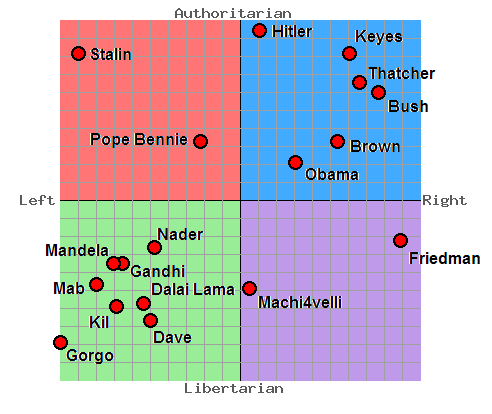 Later in the night we turned our attention to everyone’s location in the political spectrum (chart). Politics carried us through the rest of the night, as well as an awesome Star Trek video. Are the Ten Commandments really the basis for our laws? Is this what you really want atheism to become? What is Darth Vader’s diagnosis? Physics for Future Presidents, by Richard Muller. “Sometimes I see a book title that is so brilliant that I can’t help feel (as a writer) ‘I wish I’d thought of that.’ This is just such a title. It’s a brilliant concept — the physics any decent US president really ought to know to be able to make the decisions that face him or her. What’s more, the contents live up to the title. Physics professor Richard A. Muller delivers some real surprises, separating what many of us think we know from reality. In five sections, handling terrorism, energy, ‘nukes,’ space and global warming he delivers some devastating truths, putting across information that it’s hard to believe any president has really grasped — yet it’s so important that they do. I don’t want to go into too much detail — read the book — but, for example, in the terrorism section he points out that petrol (and aviation fuel) has more energy per ton than TNT. This was why the Twin Towers came down on 9/11 — not because of the impact of the planes, but the energy released by the burning fuel. Each section uses the main theme as a starting point, but then pulls in other ideas. So, for example, while the space theme has plenty about the fact that manned spaceflight is not undertaken for scientific reasons (he argues strongly against it, encouraging much more unmanned space work), he also covers the use of gravity for remote detection, and the use of non-visible light (infra-red, radar etc.) in intelligence gathering. One small gripe and one big one. The small gripe is that it’s a shame there isn’t a European edition of the book. Muller has used US units throughout, rather than scientific units (Fahrenheit temperatures instead of Celsius, for instance), which is ideal for the target audience of would-be US presidents, but less helpful over here. The big one is I think there is one big section missing — pure physics. It doesn’t really come through that there’s any need to do physics without an immediate application. In the past this has meant passing the crown for nuclear physics from the US, with the cancellation of the Superconducting Super Collider, to Europe with the Large Hadron Collider (due to go live days after this review was written) — future presidents should understand the implications of not putting money into such valuable research. There were 14,003 daily visitors this week.